To know what the new Mini is all about let me first tell you what the old one was like. The previous generation Mini Cooper that is still available in our showrooms was an enjoyable car as long as you had the roads to enjoy it on. By that I mean the roads had to be smooth and fast and flowing. On bad broken stretches of tarmac you would wish you had never got into the car let alone buy it. That was because of a suspension that was setup so stiff it rattled not just the car but every bone in your body. On one particular drive that involved almost everyone in the team, not one amongst us wanted to drive it for more than a couple of kilometres. Over most of these surfaces the Mini felt perfectly normal or as comfortable as any well sprung car. So the most important question to ask above all else is, has the ride quality improved? That questionable ride quality is a good enough place to start with the new Mini then. With a lot of the development work on the new Mini shifting to Germany one of the first aspects looked into was retuning the suspension. 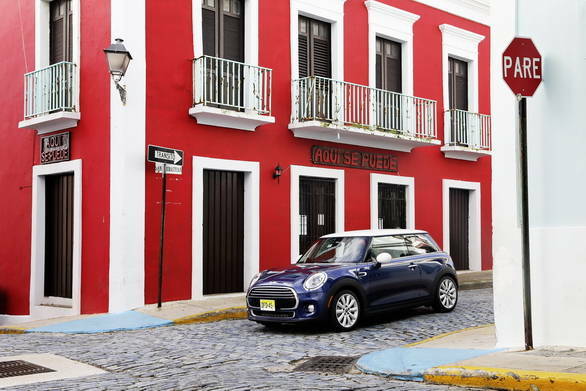 The new Mini continues to use the proven MacPherson spring strut assembly at the front with a multi-link rear axle. The dampers and spring ratings, however, were optimised to the point where the suspension feels stiffer, yet the ride overall feels better than before. Puerto Rico, let me assure you, has pretty much the same road conditions as we do back in India. Broken patches filled with potholes, rutted surfaces, loose gravel and scratched tarmac can be found all over the place. Over most of these surfaces the Mini felt perfectly normal or as comfortable as any well sprung car. The ride wasn't harsh or hard in any way. The new Mini continues to use the proven MacPherson spring strut assembly at the front with a multi-link rear axle. Yet every time the car crashed into a pothole, you felt something would fall off the car and be left behind. So while there is a fair amount of stiffness it isn't something that disturbs you. Another aspect that came to my notice were the tyres we were driving on, 17-inch low profile rubber is definitely not very conducive to providing good ride quality. 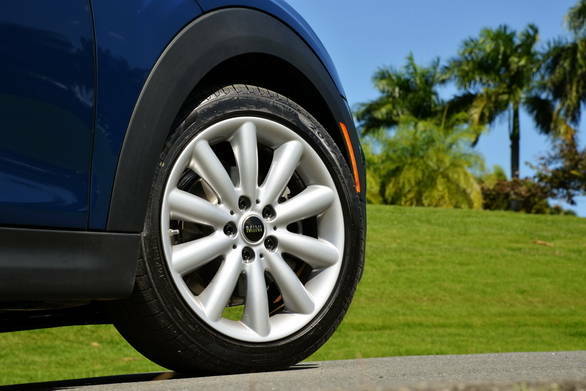 Handling yes is favoured by these tyres, but comfortable ride is definitely not a priority and yet the Mini felt reasonably comfortable. In our favour, India spec models will get the 15-inch wheels and tyres, which means that the tyre profile will get higher and thus ride should improve. So does better ride compromise the handling? Tremendous effort was spent in making those few degrees of improvement to the Minis handling character, giving the Mini a more go-kart like feel and all I will say the small inputs here and there are worth it. It has that sense of precision and purity that BMW reserves for some of its best performance machines. 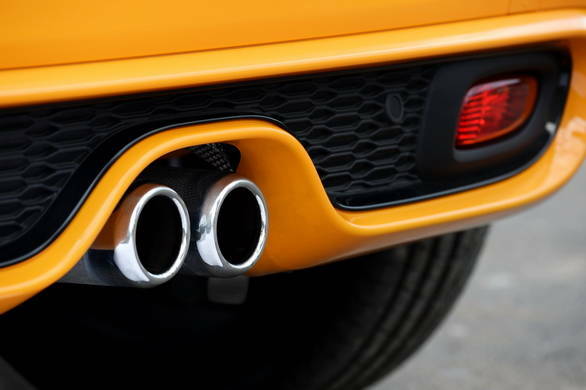 The suspension optimisation, the enhancement to the steering ratio and the move to lighten certain elements, balancing out the weight distribution, lowering the ground clearance, and an increase in the wheelbase to track ratio enhance the way the Mini feels on fast curvy sections. It's precise, articulate and linear. 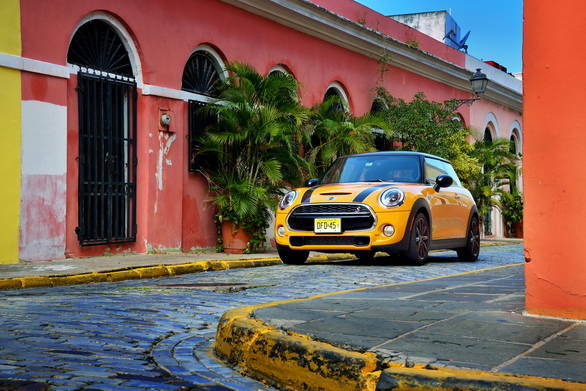 Slip the Mini into sport mode and you get this uncannily familiar precision. 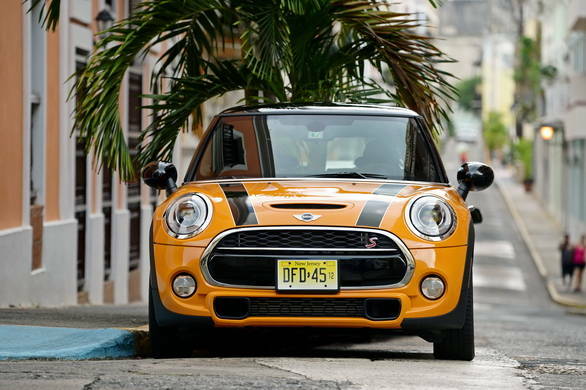 Point the steering to a series of corners and the Mini will pounce on it like a dog after a ball. 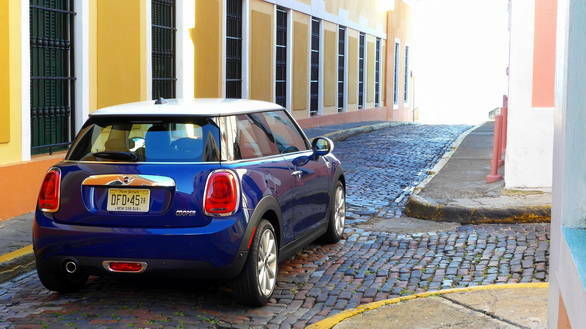 Yet a lot of the Mini's handling depends on the kind of surface it's driven on. Scarred surfaces result in a small amount of twitchiness because of that stiffness, though on smooth surfaces it almost moves like it were glued to the surface. Even the steering though heavy is superbly quick to turn into corners and very, very direct! Puerto Rico did not offer much by way of high speed motoring but on the small stretches of motorway it showed a high degree of stability. The new Mini clearly is true to the go-kart like feel that BMW wants to provide, surrounded in some luxury and funky trappings. So how does the new one look then? And has the material quality improved? Yes and yes on both counts. 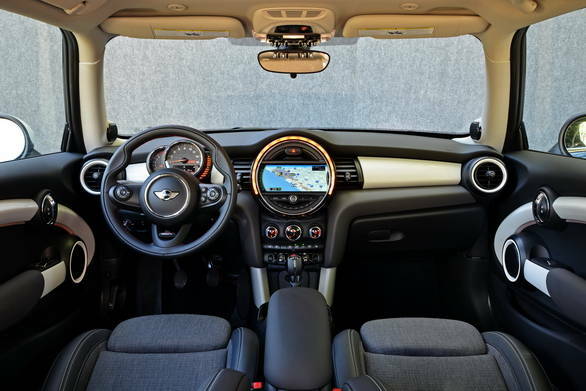 From the outside though the change isn't something that is immediately apparent and you could easily mistake this for the previous generation Mini. Those with an eye for this will notice the new grille and realise that it has changes and so do the headlamps. At night the LEDs in the headlamps are a dead giveaway that this is a new car. 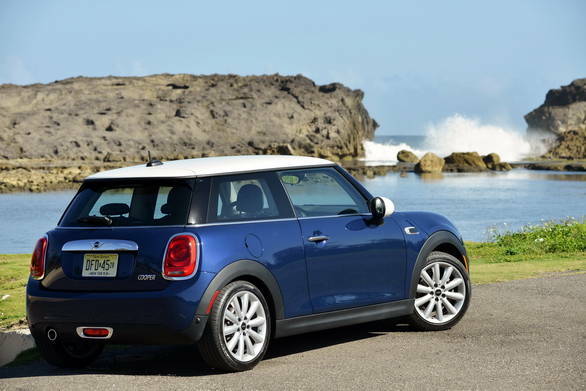 In the new Mini, the dimensions have changed as well, 98mm longer, 44mm wider and just 7mm taller than the last car. That isn't a visible change but what it does is increases the wheelbase by (+28mm) and the track (+42 front/+34 rear) to give it a slightly larger footprint to stand on, and that is always a good thing for any car. Inside the Mini the first and most obvious change is the layout of the dashboard. If you have followed this car then you'd know the last-gen version had its speedometer and other instrumentation located in the big dinner plate-sized information display in the centre of the car. Now the speedometer has moved to a more conventional position behind the steering wheel along with the tachometer. I quite like the fuel indicator which is just a row of lights stacked vertically right next to the speedo housing. Almost everything inside this cabin is a very funky element without a thematic explanation for anything. Buts it's captivating, not an eyesore. On the material quality front quite a bit has changed, nothing to start with has a plasticky feel to it. Fit and finish is also much better and despite the few bumpy patches nothing inside the cabin rattled on the roughly 150 kilometre drive. Where the older car was concerned just leaving the city of Mumbai would loosen some fastening or the other inside the car. Every Mini comes equipped with sports seats, the Mini One and Cooper upholstered in fabric moving towards leather in higher spec variants such as the Cooper S. The same applies to the dashboard with lower variants getting a piano finish veneer on the dash while moving up you get more of a carbon fibre kind of finish. Yet Mini gives you a wide choice of upholstery to choose from so you can furnish either variant with whatever suits your sensibilities. I absolutely loved the control switches which are so aircraft like. The ignition start/kill switch which is found in the centre of the console is just like those seen in fighter jets. Flick it up or down to switch on or off the engine. 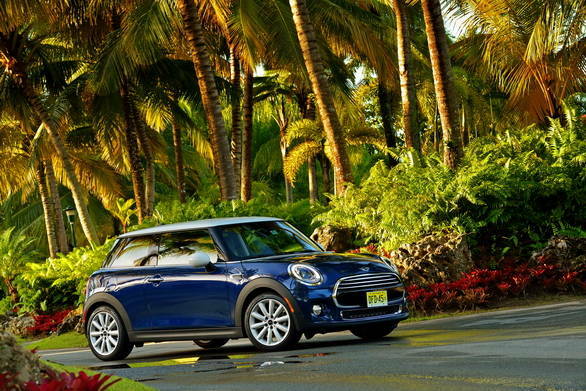 The other big play at Mini is practicality, is that true? I do think a bit more practicality can definitely find space in this car. 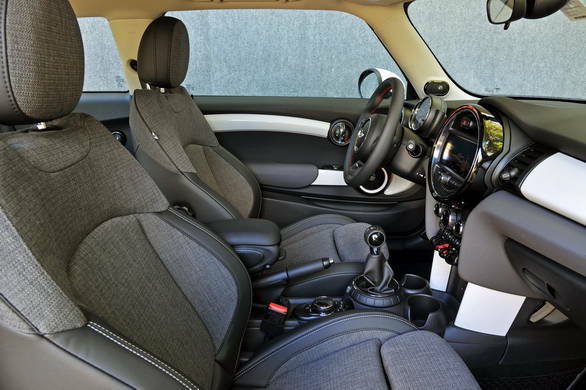 We are clearly seeing more practical solutions in compact modern cars where seats are slimmer yet supportive, in cabin elements take up less space and things feel lighter, airier and relaxed. I mean look at Honda's man maximum machine minimum policy and you'd understand just how the Japanese are nailing the space issue inside sub 4-metre cars. I don't see why the Germans can't seem to figure this out and make their cabins more cavernous than the dark small caves they turn out to be. I'd like to know if there are any claustrophobic people out there who own a Mini? 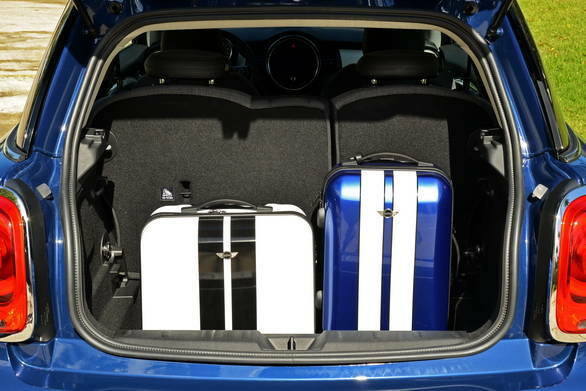 Even the boot is extremely small and unless you fold down the rear seats it's best for a couple of large backpacks or a medium sized stroller. I quite like certain touches such as how the door lock switches have now moved into the door handles itself. I also absolutely loved the control switches which are so aircraft like in form and function. The ignition start/kill switch which is found in the centre of the console is just like those seen in fighter jets. Flick it up or down to switch on or off the engine. Even the overhead light switches are just a joy to look at or operate. On another note, ergonomics could have played a less funkier role in the entire equation. The handles to adjust the backrest for instance could have been a bit more sensibly designed. The passengers in the rear could also do with a bit more space unless you come from the Shire! When the four-door version comes out, it will also provide a more practical solution to stepping into the rear bench. Then the electronics, and I do think most of these have moved up several notches. Thanks to BMW's far more intimate role in the development of this car stuff like the central information screen are now closer in operation to BMW's iDrive system. It's easier to navigate through systems and looks also much more pleasing. What I did like most was that BMW's precision brings a certain correctness to the British funkiness and character. 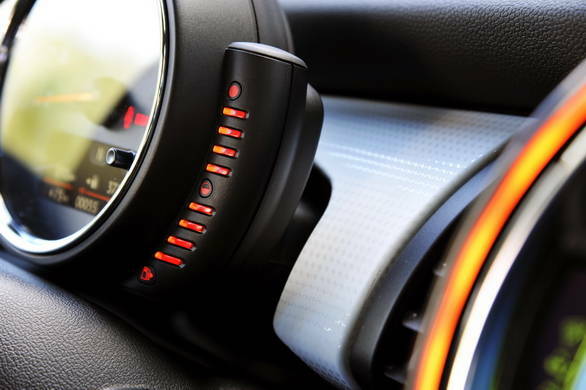 For instance, when you slip the Mini into sport mode the centre console displays a small message that reads "maximum go-kart feel" while a line diagram of the Mini Cooper has two comic strip bubbles popping out showing a rocket ship in one and a go kart in the other. So while the practicality quotient may not be very high, I definitely think this car is a lot of fun. The other big news are the new 3-cylinder engines, are they any good? Definitely yes, because this isn't a British engine, it's an engine developed by the Germans and BMW is reputed for making superb petrol and diesel engines. The 3-cylinder engine is offered in 4 states of tune, 2 of these run on petrol and 2 on diesel. I did not get a chance to drive the diesel because this is America and diesels are still not important in the larger scheme of things. Neither did I get to drive the Mini One which is the smallest displacement lowest output 3-cylinder petrol engine offered in the Mini. Will this come to India? I doubt it since the price just won't justify the 105 horsepower output. 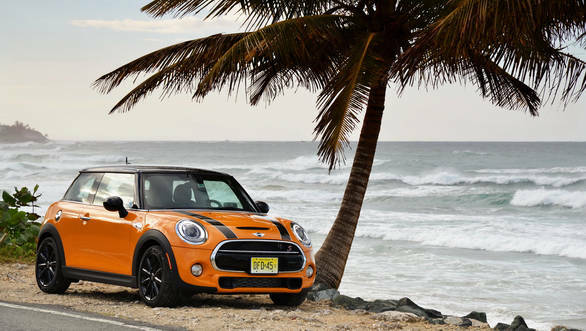 BMW India also continues to maintain its position that the Mini will not be offered with a diesel in the Indian market, though that stance could change in the future. 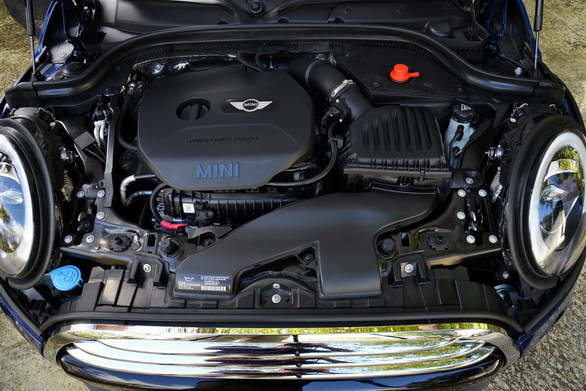 So onto what I did drive, the 1.5-litre 3-cylinder petrol engine in the Mini Cooper, which is the middle order hatchback. This engine has a 136PS rated output and is capable of hitting the ton in 7.9 seconds, which is immensely quick for such as small engine. The magic comes from the twin stage turbo and the variable valve timing which is another BMW highlight. The twin stage turbo takes care of the low rpm turbo lag, enabling the engine to respond instantaneously to any throttle input. So acceleration is sharp and quick but even more impressive is the breadth of torque. 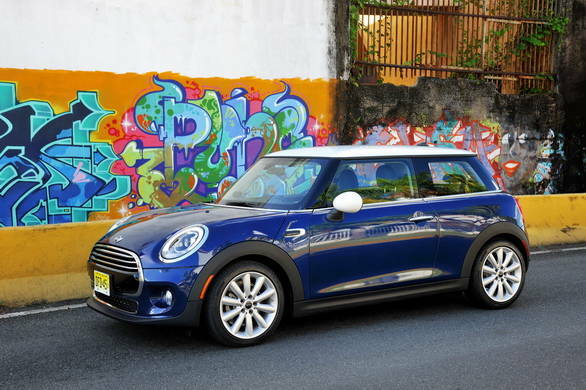 On some of the more crowded urban streets the Mini Coopers petrol engine almost felt like a diesel, chugging away at ridiculously low speeds in third gear without a hitch. Just a small jab of the throttle and it was ready to fly off in haste without having to drop a gear. Now this I experienced in the manual transmission Mini Cooper, what will come down to India is the automatic version so undoubtedly the drivability will be much better. The variable valve timing on the other hand makes sure that while performance is not compromised, there is a definite balance between it and fuel efficiency. 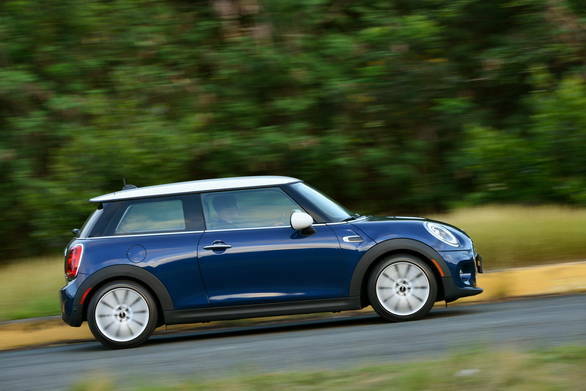 192 horsepower and 0-100 time of 6.8s makes this the flagship Mini you can buy. It too has a twin stage turbo with variable valve timing, but the turbo is in a slightly different stage of tune and a double VANOS camshaft control balances power and efficiency. This engine is a small little keg of gunpowder that just explodes every time you stab the throttle. This came mated to the 6-speed automatic with paddle shifts behind the steering wheel whose ratios are optimised to the torque curve though I do wish the shifts were a bit faster. I quite enjoyed the linearity with which this engine delivers its charge, revving all the way up to 6500rpm. 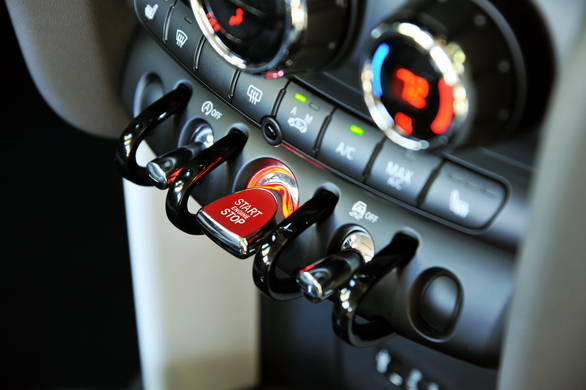 The Cooper S also gets a selectable drive mode which is found on a bezel surrounding the base of the gear shift lever. It allows you to change between sport to a mid and green ecologically conscious mode. In either mode engine maps change but if you optioned the dynamic damper control system then even the suspension stiffness can be altered. Each of the modes alters the steering feel, the damper control, the throttle responses, the gear shift speeds and even the exhaust note. What I won't make much mention of is the gimmicky bits and there are a whole lot of these in the Mini, some as optional equipment some as standard stuff. These don't add much value to the car but as an experience they do leave a good taste in your mouth. This is a fun car and the chaps at a sterile clinic in Germany where the Mini was worked on probably aren't the same bunch as the ones that make all those BMW cars. That is a good thing because you distinctly get the feeling that the Mini has improved and moved away from what it used to be. 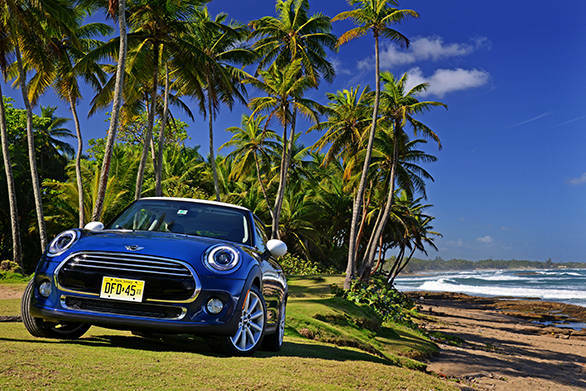 The new Mini then is a well thought out car and it's only role in life is to be an enjoyable mode of transport. 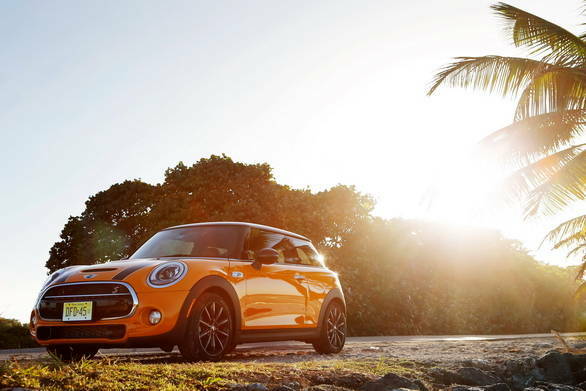 The new Mini isn't your everyday car but it has all the potential in the world to make every day cheerful!